WASHINGTON Feb 12, 2006 (AP)— Unheeded warnings, poor planning and apathy in recognizing the scope of Hurricane Katrina's destruction led to the slow emergency response from the White House down to local parishes, a House investigation concludes. The 600-page report by a special Republican-dominated House inquiry into one of the worst natural disasters in U.S. history concluded the federal government's response to Katrina was marked by "fecklessness, flailing and organizational paralysis." WASHINGTON - The earliest official report of a New Orleans levee breach came at 8:30 a.m., hours after Hurricane Katrina roared ashore. Word of the possible breach surfaced at the White House less than three hours later, at 11:13 a.m. In all, 28 federal, state and local agencies reported levee failures on Aug. 29, according to a timeline of e-mails, situation updates and weather reports that Senate Democrats say raise questions about whether the government moved quickly enough to rescue storm victims from massive flooding. WASHINGTON (CNN) -- Internal Department of Homeland Security e-mails -- requested by a House select committee investigating the government's response to Hurricane Katrina and obtained by CNN -- show infighting, gaps in communication and general frustration. Homeland Security Secretary Michael Chertoff is scheduled to testify before the committee on Wednesday. Underscoring his pledge to rebuild the Gulf Coast after Hurricane Katrina, President Bush wrapped up his eighth trip to the storm-wracked region Tuesday by hammering nails in Covington and meeting with federal representatives on the West Bank. BATON ROUGE - With the help of satellites spotting storm-damaged areas in New Orleans, the federal government has determined that 253,000 applicants for federal aid in Louisiana are eligible for a newly announced $2,358 cash advance toward three months rent to assist people displaced by Hurricane Katrina. Ron Sherman, the housing coordinator for the Federal Emergency Management Agency in Louisiana, said Monday the agency is expecting to shell out $600 million of rental assistance in the next two weeks to people across the nation who left the New Orleans area because they no longer can live in their homes. The money is supposed to be mailed or electronically transferred automatically to qualified evacuees who have registered with FEMA. However, agency letters being sent to applicants warn that they must complete and return an additional FEMA form within 14 days or they will not be eligible for additional benefits. FEMA Form 90-69B, a document called a Declaration and Release that is supposed to be included with the agency letter, must be sent to FEMA or the applicant may be required to return the money already received, according to the agency. The form is a declaration that the person receiving the benefit is telling the truth. WASHINGTON (CNN) -- President Bush said he wants to make it easier for the military to take charge after a disaster like Hurricane Katrina, but the White House acknowledged Monday the proposal raises "a lot of issues" that need resolution. Critics argue that putting active-duty troops on American streets would violate a long-standing tradition that keeps the military out of domestic law enforcement. "I want there to be a robust discussion about the best way for the federal government, in certain extreme circumstances, to be able to rally assets for the good of the people," he said. NEW ORLEANS, Louisiana (CNN) -- President Bush pledged Thursday night to put the full might and money of the federal government behind the reconstruction of the Gulf Coast and vowed to its people that "in the journey ahead, you are not alone." 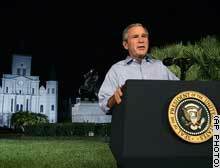 In a nationally televised address from Jackson Square in the historic French Quarter of New Orleans, Bush outlined his plans to assist recovery efforts and to prevent bureaucratic errors of the sort that slowed the response to Hurricane Katrina. The president said the federal government will pay for most of the costs to fix damage during and after the storm -- the most destructive hurricane ever, according to the National Oceanic and Atmospheric Administration -- struck August 29.